Find hotel near Ripley's Believe It Or No .. 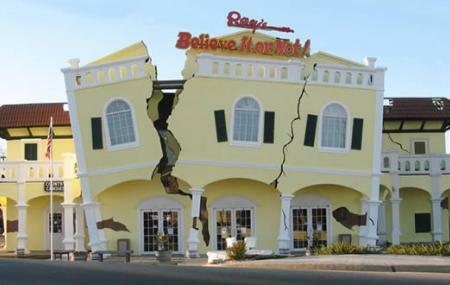 Situated inside Pleasure Beach in Blackpool, is the city’s very own Ripley’s Believe it or not! That’s right, the franchise famous around the world for dealing in everything strange, unusual and downright bizarre has a museum right in the heart of Blackpool’s biggest tourist attraction. Spread across 2 floors and 8 thrilling galleries, the museum features oddities like a 2 headed calf, eerie shrunken heads and a portrait of Lady Diana made out of 2,500 pennies- and we’re only scratching the surface. The Ripley’s Believe it or Not ‘Odditoriums’ have an eclectic mix of the most unusual artefacts from different countries and fields, both big and small. Some of the items on display will be intriguing to all, such as junk art masterpieces and the staircase with weird facts on every step. On the other hand, some of the displays are sure to make even the most lionhearted squirm- ever heard of the human candlestick? Measure yourself up against life sized replicas of the tallest and largest human beings of all time. They have a very good collection of wooden African tribal statues, which include strange models like the Ashanti execution statues and the equally odd fertility statue. All in all, the Blackpool Ripley’s Believe it or not is a fun little place to hang out, and get your mind blown at the same time. You can save up by purchasing tickets online, or on a package deal when buying Pleasure Beach tickets. The attraction is not wheelchair friendly, as it is spread out over two floors and they do not have an elevator system. Compared to other Ripley’s exhibits around the world, this one is relatively small and doesn’t take too much time to explore- something you should know while planning your day around Blackpool. The nearest car park is located on Ocean Boulevard. The entrance to the car park is on Watson Road. Car parking charges apply. You are allowed to bring still and video cameras into the premises, so don’t forget to carry them along! Buses No: 1,12, 14, 16, 61 go to Pleasure Beach (Blackpool), by Napier Avenue. Love this? Explore the entire list of places to visit in Blackpool before you plan your trip. Fancy a good night's sleep after a tiring day? Check out where to stay in Blackpool and book an accommodation of your choice. How popular is Ripley's Believe It Or Not? People normally club together Pleasure Beach and Sandcastle Water Park while planning their visit to Ripley's Believe It Or Not.